Tokyo is Japan’s New York, Los Angeles and Washington, DC, all rolled into one giant megalopolis. Although 50% of Japanese adults own cars, Tokyo is a public transportation city, and the system is a very good one. Like everything in Japan, the Tokyo Metro is incredibly clean. Everything is spotless. This is the cleanest metro system the Train Cowboy has every seen. Add to this the fact that the Japanese as a people have something of an obsession with cleanliness both environmentally and personally, and the whole experience is rather sweet smelling. While many metro systems feature a lot of body odor, Tokyo’s smells great. Everyone on the train is clean, well groomed, and quiet. 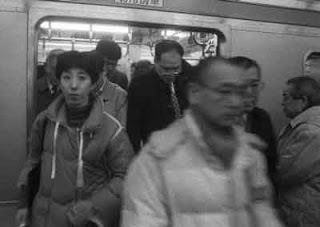 The Tokyo trains are so crowded in fact, that you really cannot move. Add to this the facts that the average train commute in Japan is 90 minutes each way and that many Japanese must get up extremely early to get to work and an interesting phenomenon occurs. Frequently, people will fall asleep standing up. The Train Cowboy actually mastered the technique. The general practice is to put one hand up on a bar or handle above the head and then cracle one’s head in the elbow crook. In truth, many people manage to sleep even without having an arm up to hold their head. (In addition, there are always many people snoozing away in seats they have managed to grab. While most people keep to themselves on the Tokyo metro, The Train Cowboy likes to get to know the locals, and as a gaijin, this is easy, and accepted. (In fact, the Train Cowboy has met some very beautiful women on the Tokyo trains… but that is material for a different blog… 8>) Still, if you are visiting, this is a fun aspect of the trains of Tokyo. 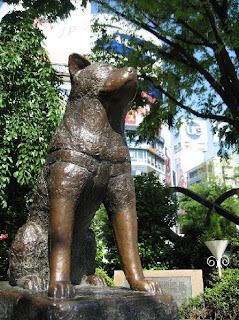 Another cool ritual of the Tokyo system involves the employees, who benefit from an excellent esprit de corps. One example involves the drivers of buses, who always wave to one another as their buses pass, and the caboose monitors on the trains, who wave to their caboose counterparts as trains trail off away from each other in opposite directions. The Tokyo metro has pretty good coverage, with the city’s central region particularly well serviced. The circle running Yamanote is the system’s most famous, and for many the most desirable subway “address”. One negative is the great size of the system, and number of different trains has lead to some integration problems. The Train Cowboy was shocked to have to leave the rail system and walk several blocks to reach a privately run subway system. These stations should be integrated and connected, even if you have to pay for entrance separately.The other negative is that the trains do not run all night, stopping around midnight most nights and not starting up again until 5am. This results in late night partiers having to stay in their nightclubs, even after they just want to sleep. A city with Tokyo’s global stature should have trains that run all night. Buses 10 out of tenCleanliness/Art 9 out of 10 The cleanest and sweetest smelling metro system in the Universe! But lacks art. Timeliness 10 out of ten, the trains run to the second. 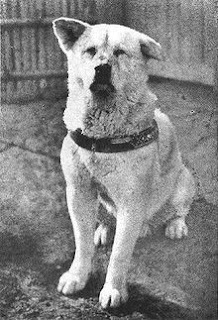 Crown Jewel: Hachiko the Loyal Dog.